Starting my day at Bill’s Cafe! July 17, 2015 July 17, 2015 ~ Trevis Dampier Sr. The Austrian-born Bernays was the nephew of Sigmund Freud, and was quite good at using psychology to get people to buy a product or an idea. He was the guy who was hired by the Aluminum Company of America to use the American Dental Association to convince people that water flouridation was safe and healthy to the public. His campaign for Dixie Cups scared people into thinking the glasses they were drinking out of were unsanitary, and could be replaced by disposable cups. Bernays was hired by President Coolidge to help run his re-election campaign in 1924, and encouraged Coolidge to invite the country’s leading vaudevillians to the White House for a meet-and-greet over pancakes. This was one of the first known political pancake breakfasts that are now so popular among presidents and council members alike. Bacon and any breakfast dish you choose..Honey Oat Pancakes! It’s breakfast time and I want something memorable today.. There is no better breakfast location than Bill’s Cafe! When I’m looking for breakfast, I’m looking for something that is different than what I can get at home and obviously tastes just as good or better. I have been going to Bill’s for years and it is everything you can hope for at a diner. Great coffee, friendly workers, succulent bacon and great pancakes. The other part which is difficult for most diners and restaurants is consistency. Bill’s Cafe is always consistent with all of its greatness in all of its’ locations. The bacon is some of the best I have ever tasted! 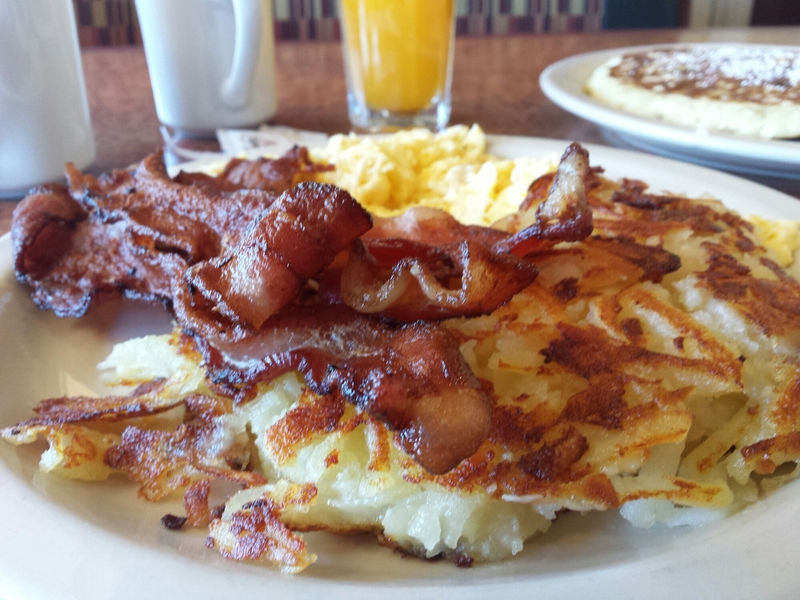 The hashbrowns have a perfect crisp layer on the top but soft at the bottom. ..
And the pancakes!!! Oh the pancakes!!! They are just out of this world! 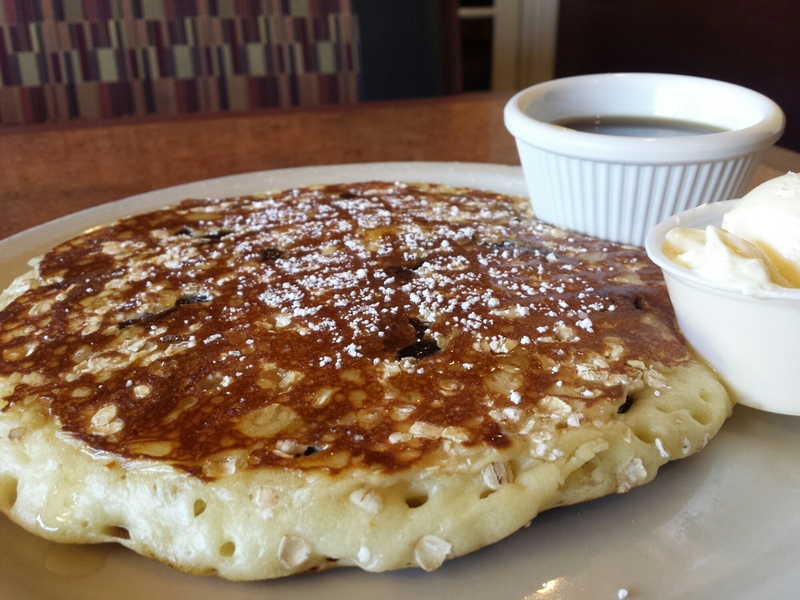 I usually get the bacon and eggs meal with hashbrowns and I switch the toast out for a delicious honey oat pancake which is their buttermilk cakes filled with cinnamon,oats, raisins and drizzled with honey. Each bite is a wondrous burst of freshness and delightful flavors! True live action eating! Good job Bill’s Cafe! < Previous There ain’t no doubt that I love Chili’s Southern Smokehouse! Next > Have a Dinosaur Leg Taste at Menlo Park’s Connoisseurs’ Marketplace!